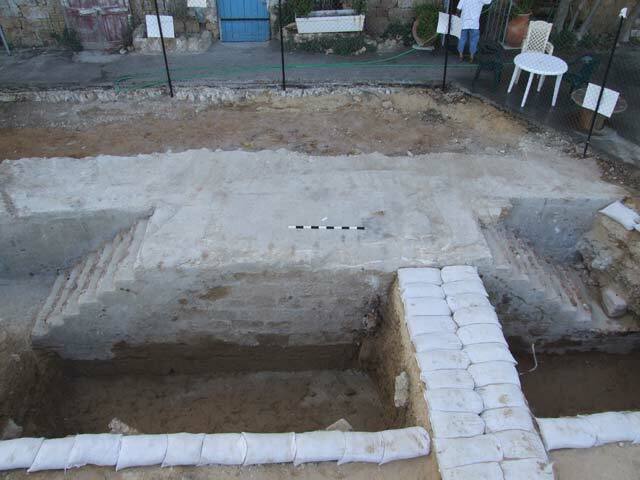 During July–December 2007, a salvage excavation was conducted within the precincts of the Yafo harbor (Permit No. A-5198; map ref. NIG 17656–67/66237–52; OIG 12656–67/16237–52; Fig. 1), prior to the construction of a promenade. 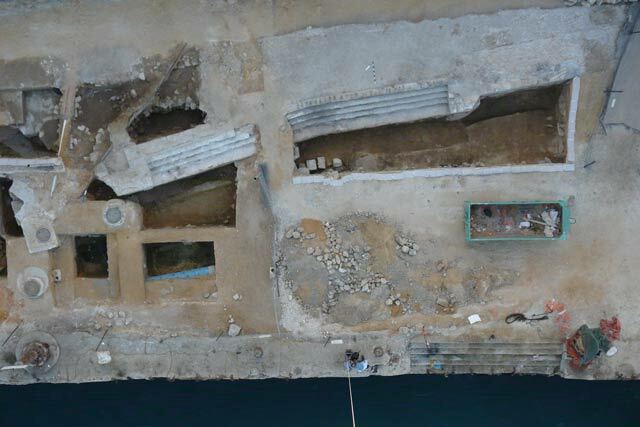 The excavation, undertaken on behalf of the Israel Antiquities Authority and underwritten by the Tel Aviv-Yafo Municipality, the mishlamah to Yafo and Yafo Harbor, was directed by E. Haddad, with the assistance of U. ‘Ad (Area A supervision), H. Torge (Area D supervision), E. Jakoel and L. Talmi (Area E supervision), S. Ya‘aqov-Jam and E. Bachar (administration), D. Porotzky and V. Pirsky (surveying and drafting), T. Sagiv (field photography), Skyview Company Ltd., (aerial photography), Y. Nagar (physical anthropology), I. Ktalav (mollusks), E. Ayalon (Marseilles roof tiles), laborers from a manpower company and D. Barkan, M. Ajami and L. Rauchberger of the IAA central region (inspection after excavation). Thanks are extended to R. Baransi of the Shtang Company for valuable cooperation, E. Eden the harbor architect, the sea-scout team, the workers in the harbor and the residents, as well as the fishermen who took a great interest in all that was going on. The outline of Jaffa harbor had been altered during the British Mandate era, in 1934–1936. A poured concrete wharf and a series of the breakwater’s concrete cubes to the west, that reached Andromeda’s Rock, were built. The British attempted to turn Yafo harbor into a deep-water port by expanding it to the west through land reclamation, building the wharf along its western border and making it deeper. Five areas (A–E; Fig. 2), between the harbor’s northern gate and Hanger 1, were opened. It became apparent at the beginning of the excavation that the area was severely disturbed by numerous modern infrastructures. 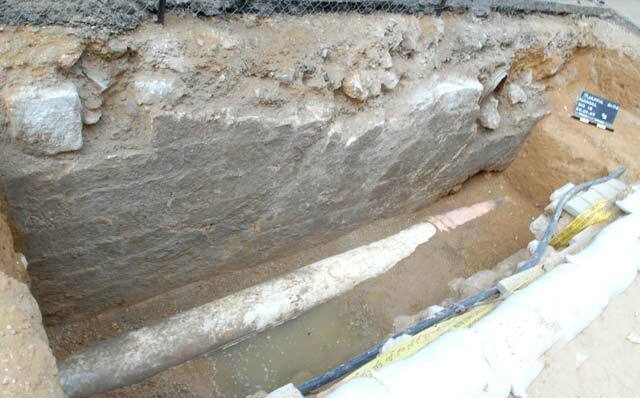 A previous excavation had partly documented the sewer installed within the precincts of the wharf (HA 65-66:25–26 [Hebrew]) and at the end of the 1990s, three excavations were conducted on Ha-‘Aliya Ha-Sheniya Street, prior to infrastructure development (HA-ESI 111:40*–41*; 114:53*; Permit No. A-2848). 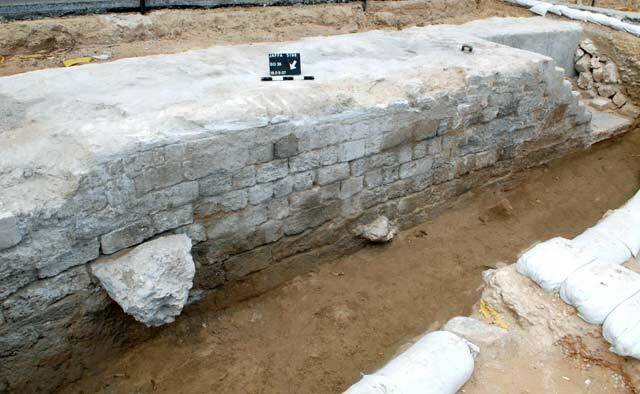 The excavation exposed five strata that indicated the main construction phases of the harbor walls from the Crusader period until the British Mandate era. The strata are described from earliest to latest. Stratum V is dated to the Crusader period. A northeast-southwest oriented wall, built of medium-sized ashlar stones with whitish bonding material (length c. 22 m; Fig. 3), was exposed in Area A, c. 1 m west of the Greek Orthodox Church compound line. The face of the wall was slanted and carefully constructed (c. 8 courses; preserved height above sea level c. 2.3 m). 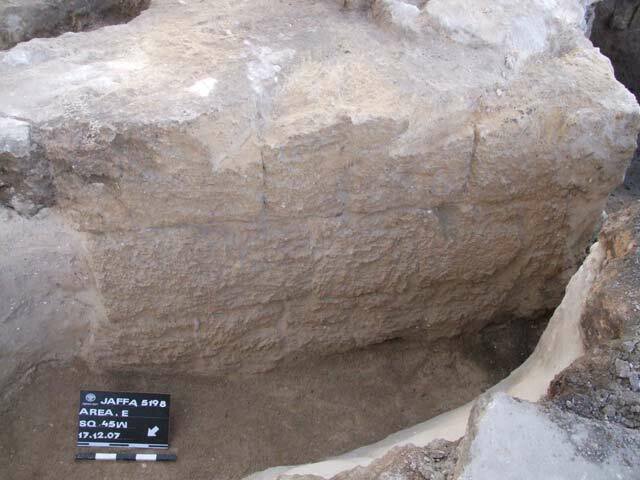 J. Kaplan excavated sections of this wall in 1978 and dated them to the Crusader period (ibid., HA 65-66). North of Hanger 1 in Area E, an impressively constructed fortification that was probably part of the Crusader fortress that protected the harbor from the south, was exposed (Figs. 4, 5). The 3–4 bottom courses of a wall, aligned east–west and built of massive kurkar stones, were exposed. The wall was built as a glacis (thickness c. 2 m), which slightly sloped downward and reached the level of the sea. This was the northern wall of the fortress that extended as far as the waterline. South of it, part of a wide room with a thick plaster floor, set atop a bedding of small fieldstones with whitish-gray mortar bonding material, was exposed. The room was subdivided in the Ottoman period. Leaning up against the northern side of the fortress wall and negating it was a massive foundation of small and medium-sized fieldstones that were meticulously bonded with pale gray and light red mortar. A paving that dated to the Ottoman period was built on top of the foundation. 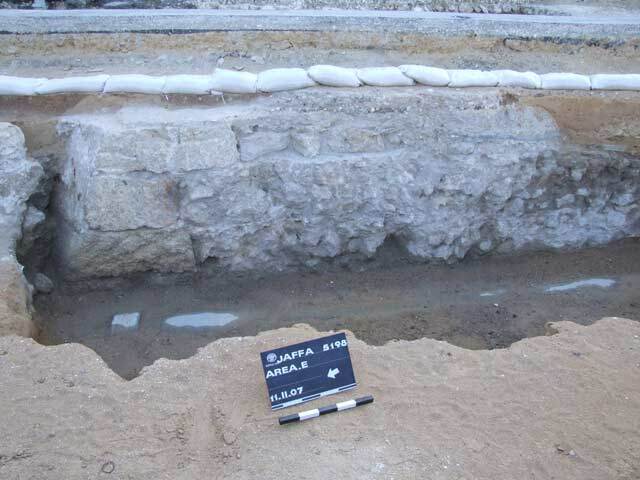 Stratum IV: A wall built of medium-sized ashlars that were bonded with whitish mortar was exposed in Area A, c. 1 m from the wall of Stratum V. The wall was poorly preserved (min. width 2 m, height c. 2 m) and it probably dated to the beginning of the Ottoman period. 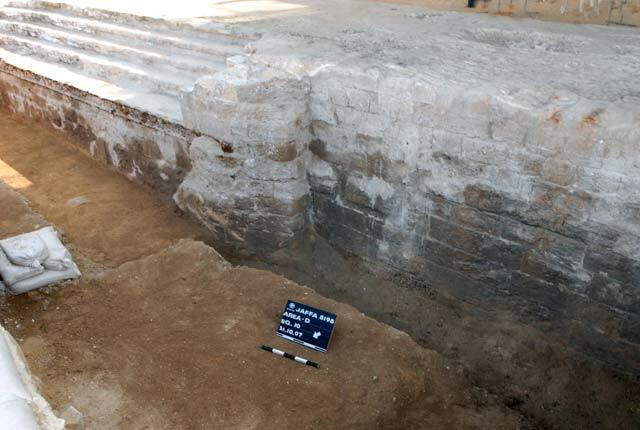 The continuation of the wall was uncovered in Area D; the upper part of one of its section was overlain with a paved surface that apparently served as a wharf (Fig. 6). The wall was severed by the Ottoman customs house that was built above part of this wharf. Stratum III is dated to the Ottoman period. A wall (Fig. 7) was exposed along the entire section between the southern border of the Mandatory customs house and Hanger 1. 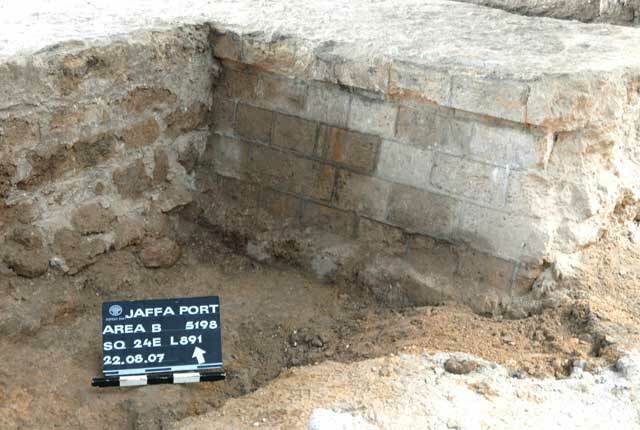 A probe trench dug east of the wall revealed that it was located c. 2 m west of the wharf, which was ascribed to Stratum IV. The wall consisted of medium-sized kurkar ashlars. Larger and longer ashlar stones were used in the bottom courses, as well as ashlars with drafted margins that were probably in secondary use from the Crusader period. The concave outline of the wall did not extend in a straight line from north to south and it was preserved to at least 2 m high above the waterline. The wall stood to its greatest height at least until the year 1875, as seen in photographs taken by the Frenchman Felix Bonfils (Fig. 8, courtesy of the Yafo Museum and Eitan Eden, architect of the Yafo harbor). Remains of the trapezoid-shaped sea fortress (c. 20 × 30 m) from the Ottoman period were exposed in Area E (Fig. 9). A section of an impressive stone pavement that served as the habitation level in the Ottoman period was exposed on the inside of the fortress wall. 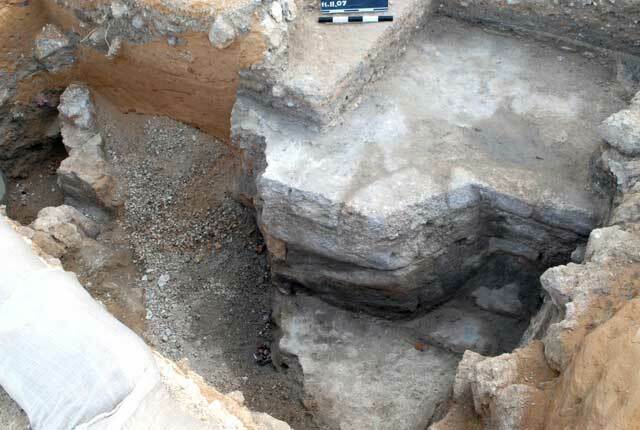 The pavement was built on top of the massive foundation from Stratum V. An underground storeroom, which bore a vault that did not survive, was exposed; its beginning should probably be dated to the Crusader period. A round corner of the Ottoman customs house that had cut the wharf of Stratum IV was exposed in Area D (Fig. 10). West of the corner in Area B, a section of its southern wall (preserved height c. 1 m), set at a slight incline on top of a broad foundation, was exposed. 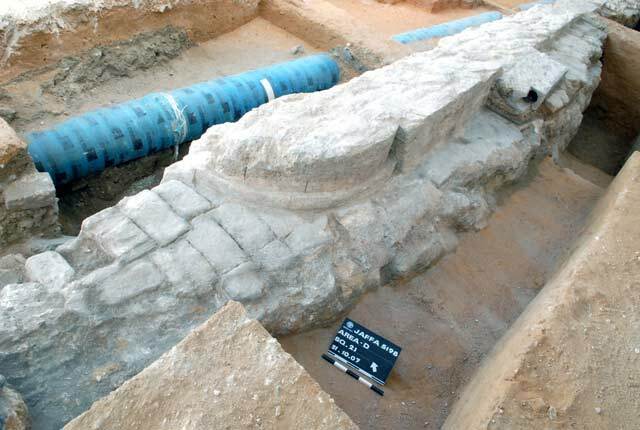 The foundation was cast of pale gray mortar poured in a mold and shows remains of wooden beams at its bottom. The wall was built of medium-sized ashlars and hard thick dark gray mortar was inserted in the joints between the stones to decorate the rectangular outline of each stone (Fig. 11). Stratum II is dated to the end of the Ottoman period–the beginning of the British Mandate era. The harbor was renewed in this stratum with the construction of a new wharf that is a rather thin, poured layer of gray concrete (c. 5 cm). This wharf followed above the outline of the Ottoman wall from Stratum III. Staircases with six steps were built along the concrete wharf to facilitate access to the water line for loading and unloading cargo from the boats that arrived at the Ottoman sea wall (Fig. 12). An iron shackle, to which the boats would be tethered, was discovered on the wharf. 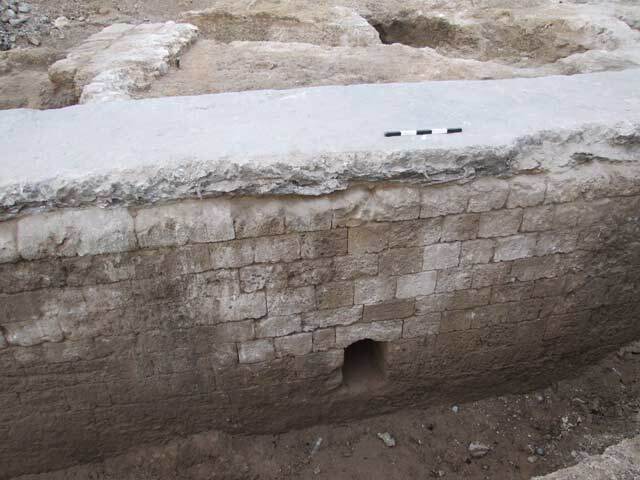 A chain secured to the front of the wall was exposed in another section and it seems to date to the end of the Ottoman period–beginning of the British Mandate era. 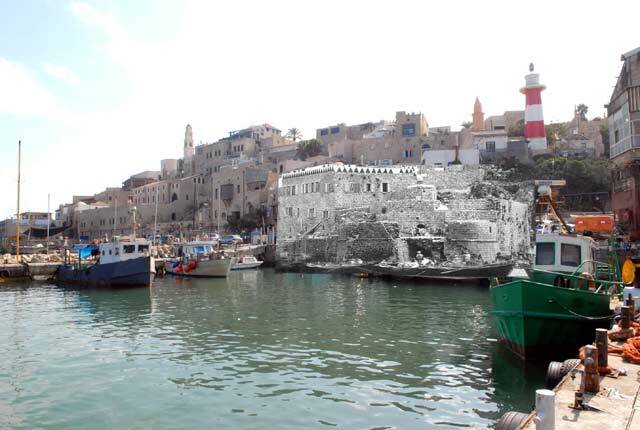 On the northern part of the wharf, a broad staircase—the ‘Sea Gate’—was uncovered; it is the largest one exposed in the harbor so far, through which people and cargo entered Yafo (Figs. 13, 14). A long iron beam was fixed in the wall below the bottom step. Engaged pillars supported the staircase in the north and south. The steps and parts of the northern pillar were constructed in 1917. Stratum I. The concrete wharf of today’s waterline is part of the harbor that was enlarged by the British in 1934–1936. The five strata are clearly represented by five massive walls that were generally oriented north–south. 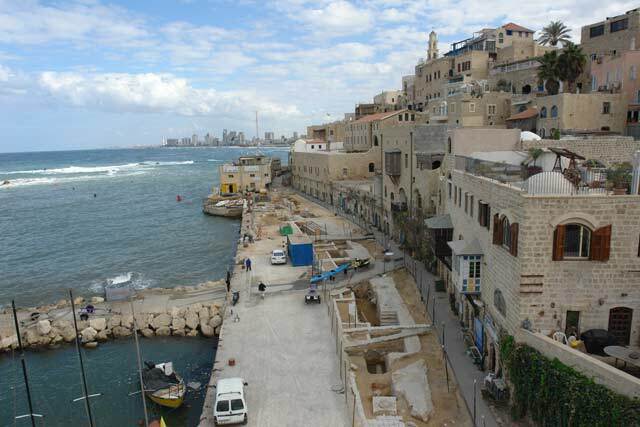 Their construction progressed westward in historical sequence and they were part of the seawalls of Yafo (Fig. 15). The eastern Crusader wall of Stratum V, in the area of the harbor and close to the present line of buildings, was built of medium-sized ashlar stones with whitish mortar as bonding material. An impressive fortification, which was probably a maritime Crusader fortress that was built of massive kurkar stones, was exposed in the south of the harbor. The wall from Stratum IV, c. 1 m west of the Stratum V wall, is probably dated to the beginning of the Ottoman period. The curved Ottoman wall from Stratum III is very imposing. 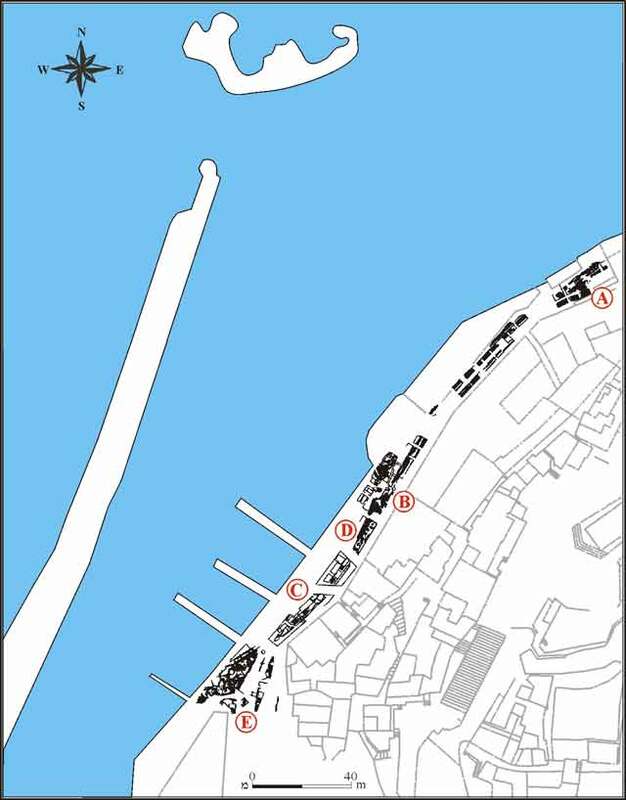 Based on the results of the excavation, we are almost certain that the waterline in the Crusader period was c. 20 m east of today’s wharf and close to the façade of the buildings in the harbor. A massive fortress whose remains served as a convenient foundation for the construction of the Ottoman fortress was erected in the Crusader period in the south of the harbor. The fortress, which protruded out into the sea, closed off this part of the harbor toward the south (Fig. 16). The excavation exposed almost the entire outline of the Yafo harbor in the Ottoman period, whose date of construction is still unknown. Technical difficulties, such as reaching the water level and in most places, the 1978 sewer line adjacent to it, precluded excavating very deep and therefore bedrock was not reached. 1. The harbor and the excavation, looking north. 3. A section of the Crusader wall, looking east. 4. The northern wall of the Crusader fortress, looking south. 5. A north–south section of the Crusader fortress, looking east. 6. Stratum IV, a pillar in the wall of the wharf. 7. A section of the Ottoman wall, looking southeast. 8. 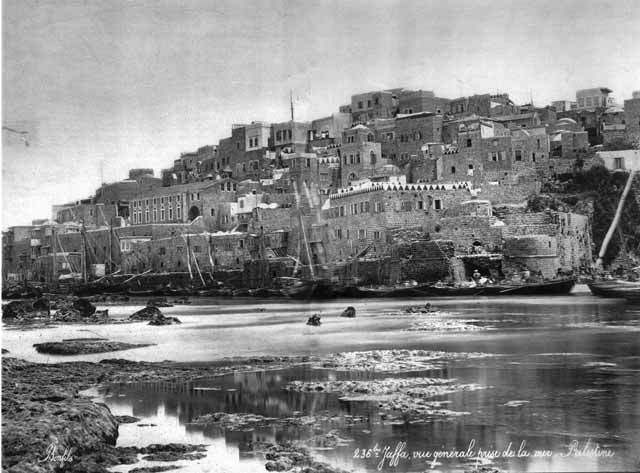 Yafo and the Ottoman seawall in center of harbor, looking east (photographed by Felix Bonfils, 1875). 9. The northern wall of the Ottoman fortress, looking south. 10. The round corner of the customs house, looking north. 11. The southern wall of the customs house, looking north. 12. Staircases set in Ottoman wall after its upper part was removed, looking east. 13. The broad staircase, aerial view. 14. The southern engaged pillar and part of the broad staircase, looking east. 15. 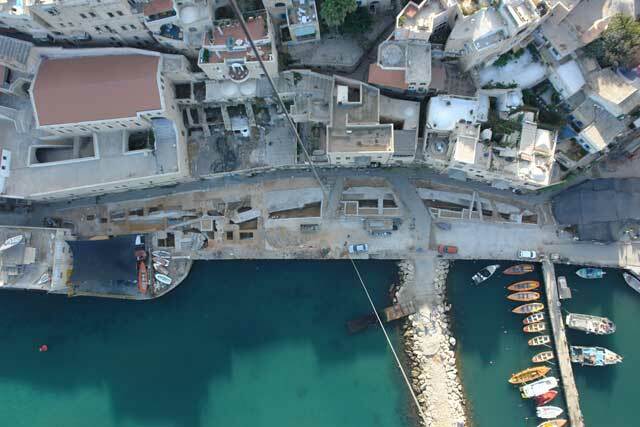 The center of Yafo harbor at the end of the excavation, aerial view. 16. 1875 phtograph superposed on current-day photograph of the harbor.